Old methodologies were never designed for large data volumes. Manual modeling or optimizing of ABAP transforms cannot handle big data. Automation with a Business Value Attainment focus is the only path to assure Business Benefits. The chart on the left indicates that despite IT and business lowering their expectations from BI projects, Gartner reports that the 'Meet Business Expectations' score is dropping more rapidly. We now need to demand 80% and over Business User Satisfaction from our partners. Fact 1- Business Value Attainment: See figure above. If we look as Gartner’s CIO BI reports from 2003 to 2012 we are faced with a strange trend. In 2003 customers expected a lot from their BI investments but only 50% of BI projects met Business Expectations. 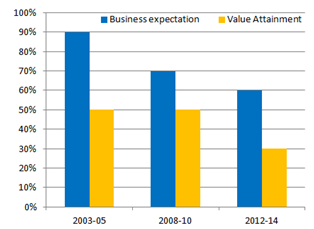 By 2012 IT and business somehow were convinced to lower their expectations and the result was a worse Value attainment. From 2003 to 2012-14 BI projects capability to meet business expectations went down from under 50% to under 30%. Fact 3- HANA costs can be reduced by over 40%: Most customers believe that the HANA migration is a rather fixed cost. No matter how we look at HANA it is not a low cost option and one of the biggest barriers to HANA migration remains the ‘sticker-shock’. It is important to realize the HANA installation, migration and annual support costs can be reduced by over 40% in most cases. In a recent BoH migration we managed to reduce the HANA migration costs by as much as 68%. Another goal we managed to achieve is our proposal for a ‘Near-Net-Zero’ HANA migration by keeping the FHRE (Future HANA Run Rate) about as close to the CBRR (Current BW Run Rate). In our final solution we actually managed to drop the FHRE below the CBRR. Fact 4: What got you here will not get you there: We are in the Fact 1 reality because of extremely faulty methodologies on one side, and ‘BI Experts’ that do not adapt to new standards and processes. The writing is clear that customers should not use current methodologies, standards, processes, resources and in some cases even partners if they want to succeed in SAP HANA, i.e. highest Business Value, Highest Information Quality at the lowest cost. In the current state of BI confusion we are witnessing a spurt of very dissatisfied customers changing from one implementation partner to another not realizing that they are simply stepping from one frying pan to another. Demand BVA deliverables, BVA based payments and add BVA project reporting attributes. Fact 5: HANA Appliance modes becoming obsolete: There is adequate evidence that the HANA Appliance model may have reached a point of obsolescence. The appliance model allows a few partners to assume a monopolistic attitude towards pricing and support. SAP's confidence in the HW architecture is demonstrated by their new TDI HANA model, where customers and data-center owners can now choose to mix- and-match their HANA components based on who does that components better than the rest and what their DC accepts. It also allows market competitive forces thereby assuring higher quality at lower costs. We have in the past month built and certified TDI devices for two customers. Proactive companies can and are achieving enormous financial and decision-capability advantages by focusing on HANA BVA (Business Value Attainment) methodologies. A. 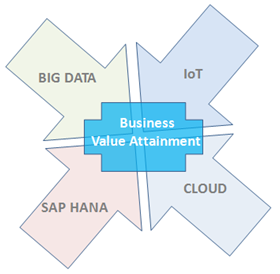 Focus on Business Value Attainment: BI implementations must be owned and architecture by IT. However, not in total isolation of business stakeholders. The only way to meet business expectations is to involve business stakeholders and users all through the process. Ask business what they would like from HANA and then try to deliver in accordance to their exact needs. One way is to conduct a zero-baseline Design thinking workshop to identify pure business value. In one project we managed to deliver a net new set of reports that increased revenues to make the whole HANA migration break even in 8 months. Start with a 2 hour business executive HANA workshops that comes with tips & tricks on business ownership and checklists to ensure that the wool some partners may be pulling over your eves is not just cotton. B. Optimize your BW prior to moving to HANA: BoH projects can leverage various automated options for reducing TCO, eliminating redundancies and dead objects, rewriting the ABAP transformations, remodeling cubes, merging multiple BW landscapes and other small things that can together reduce TCO by 40 to 60%. In one of our recent BoH projects we managed to reduce initial BW HW costs by 68%. Reduced HNRR below past BCRR. Targets most thought were unachievable. We also launched the IQDCT methodology with a target to Increase Quality, Decrease Costs and Decrease Time for migration to HANA. C. Point of Convergence: Our technologies are as a point of disruptive convergence. For any technology to qualify as disruptive it needs to deliver ‘higher quality at lower TCO’. However, if your partner, or their advisors, do not comprehend the disruptive capabilities or continues to use old methodologies then it becomes a lose-lose situation. We are currently at a critical point of convergence where four disruptive technologies are coming together with tremendous capabilities to enhance true real-time decision capabilities. With the right advisors, BVA methodologies it is now a simple process to turn your HANA migrations into a win-win future. Find a partner that can design your future state with all these four technology convergences covered from a tactical, mid term and strategic. Find a partner with a Business Value focus and capabilities to help meander between all these convergence technologies and alternatives available. D. Plan with the future in mind: The best migration is done that aligns to the SAP HANA roadmap 5-10 years from today. It optimizes, models, architects and models for the long haul. Whereas the worst SAP HANA migrations simply treat it as just another technical upgrade or migration. 6. Review if your old standards, processes, architecture, resources or partner can guarantee HANA Business Value Attainment.